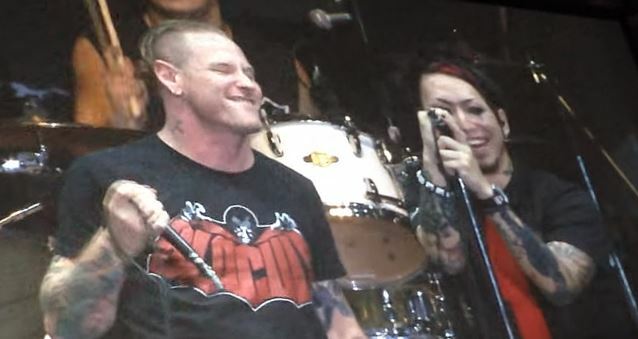 SLIPKNOT and STONE SOUR singer Corey Taylor joined the Japanese alternative metal band SILENCE IZ MINE (a.k.a SIM) on stage on Saturday, November 21 at the Ozzfest Japan at Makuhari Messe Arena (just outside of Tokyo) to perform a cover version of RADIOHEAD's "Creep". Fan-filmed video footage of his appearance can be seen below. After the performance, SILENCE IZ MINE singer Mah stated in an online posting that the collaboration with Taylor "was the happiest moment of my life." Taylor published his third book, "You're Making Me Hate You: A Cantankerous Look At The Common Misconception That Humans Have Any Common Sense Left", on July 7. The book acts as a commentary on society and pop culture said to be in the style of the late George Carlin. Taylor's second book, "A Funny Thing Happened On The Way To Heaven", was published in the summer of 2013 and landed at No. 23 on the New York Times "Hardcover Non-Fiction" best sellers list.